Krishna (कृष्ण in Devanagari, kṛṣṇa in IAST, pronounced [ˈkr̩ʂɳə] in classical Sanskrit) is a deity worshiped across many traditions of Hinduism. Krishna is often described as a dark-skinned man during his earthly descent, often depicted as a baby, as a young boy playing a flute as in the Bhagavata Purana, or as a youthful prince giving philosophical direction and guidance as in the Bhagavad Gita. The stories of Krishna appear across a broad spectrum of Hindu philosophical and theological traditions. Though they sometimes differ in details reflecting the concerns of a particular tradition, some core features are shared by all. These include a divine incarnation, a pastoral childhood and youth, and life as a heroic warrior and teacher. The worship of Krishna is part of Vaishnavism, which regards Vishnu as the supreme god and venerates his associated avatars, their consorts, and related saints and teachers. Krishna is especially looked upon as a full manifestation of Vishnu, and as one with Vishnu himself. However the exact relationship between Krishna and Vishnu is complex and diverse, where Krishna is considered an independent deity, supreme in its own right. All Vaishnava traditions recognise Krishna as an avatar of Vishnu; others identify Krishna with Vishnu; while traditions, such as Gaudiya Vaishnavism, Vallabha Sampradaya and the Nimbarka Sampradaya, regard Krishna as the svayam bhagavan, original form of God, or the Lord himself. In the list of the epithets attributed to Krishna, he is described as the 'source of all incarnations' by Rupa Goswami. Krishna is easily recognized by his representations. Though his skin colour may be depicted as black or dark particularly in murtis, in other images especially modern pictorial representations, Krishna is usually shown with blue skin. He often wears a yellow silk dhoti and peacock feather headgear. Common depictions show him as a little boy, or as a young man in a characteristic relaxed pose, playing the flute. In this form, he usually stands with one leg bent in front of the other and raises a flute to his lips, accompanied by cows, emphasising his position as the divine herdsman -Govinda, or with the gopis (milkmaids). The scene on the battlefield of Kurukshetra, notably where he addresses Arjuna in the Bhagavad Gita, is another common subject. Here, he is shown as a man, often shown with typical god-like characteristics of Hindu religious art, such as multiple arms or heads, denoting power, and with attributes of Vishnu, such as the chakra or in his two-armed form as a charioteer. Representations in temples often show Krishna as a man standing in an upright, formal pose. He may be alone, or with associated figures; his brother Balabhadra (also known as Balarama) and sister Subhadra or with his main queens Rukmini and Satyabhama. 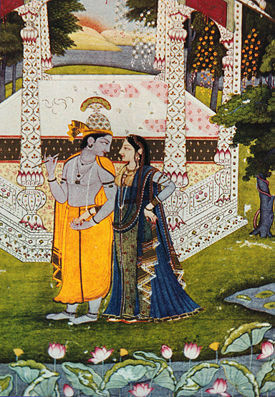 Often, Krishna is pictured with his gopi-consort Radha. Manipuri Vaishnavas do not worship Krishna alone, but as Radha Krishna. This is also a feature of Rudra Sampradaya and the school of Nimbarka, as well as that of Swaminarayan faith. Caitanyaites celebrate one of the self manifested deities called Radharamana, who is viewed as a form of Radha Krishna. Krishna is also depicted and worshipped as a small child (bāla kṛṣṇa, the child Krishna) crawling on his hands and knees or dancing with butter in his hand. Regional variations in the iconography of Krishna are seen in his different forms, such as Jaganatha of Orissa, Vithoba of Maharashtra and Shrinathji in Rajasthan. This summary is based on details from the Mahābhārata, the Harivamsa, the Bhagavata Purana and the Vishnu Purana. The scenes from the narrative are set in north India, mostly in the present states of Uttar Pradesh, Bihar, Haryana, Delhi and Gujarat. Traditional belief based on scriptural details and astrological calculations gives the date of Krishna's birth, known as Janmashtami, as either 18th or 21st July 3228 BCE. Krishna belonged to the royal family of Mathura, and was the eighth son born to the princess Devaki, and her husband Vasudeva. Mathura was the capital of the Yadavas (also called the Surasenas), to which Krishna's parents Vasudeva and Devaki belonged to. The king Kamsa, Devaki's cousin , had ascended the throne by imprisoning his father, King Ugrasena. Afraid of a prophecy that predicted his death at the hands of Devaki's eighth son, he had locked the couple into a prison cell. After killing the first six children, and Devaki's apparent miscarriage of the seventh, Krishna took birth. It was believed that Krishna was born without a sexual union. Since Vasudeva believed Krishna's life was in danger, Krishna was secretly taken out of the prison cell to be raised by his foster parents, Yasoda and Nanda in Gokul. Two of his other siblings also survived, Balarama (Devaki's seventh child, transferred to the womb of Rohini, Vasudeva's first wife) and Subhadra (daughter of Vasudeva and Rohini, born much later than Balarama and Krishna). Nanda was the head of a community of cow-herders, and he settled in Vrindavana. The stories of Krishna's childhood and youth tell of his mischievious pranks as Makhan Chor (butter thief), his foiling of attempts on his life, and his role as a protector of the people of Vrindavana. Krishna is said to have killed the demons like Putana, sent by Kamsa for Krishna's life. He tamed the serpent Kaliya, who poisoned the waters of Yamuna river, thus leading to the death of the cow-herders. In Hindu art, Krishna is often depicted dancing on the multi-hooded Kaliya. Krishna is believed to have lifted the Govardhan hill and defeated Indra - the kings of the gods and rain -to protect native people of Vrindavana from prosecution by Indra and prevent the devastation of the pasture land of Govardhan. In the view of some, the spiritual movement started by Krishna had something in it which went against the orthodox forms of worship of the Vedic gods such as Indra. The stories of his play with the gopis (milkmaids) of Vrindavana became known as the Rasa lila and were romanticised in the poetry of Jayadeva, author of the Gita Govinda. These became important as part of the development of the Krishna bhakti traditions worshiping Radha Krishna. On his return to Mathura as a young man, Krishna overthrew and killed his uncle Kamsa. He re-installed Kamsa's father, Ugrasena, as the king of the Yadavas and became a leading prince at the court. In this period, he became a friend of Arjuna and the other Pandava princes of the Kuru kingdom, who were his cousins. Later, he took his Yadava subjects to the city of Dwaraka (in modern Gujarat) and established his own kingdom there. Krishna married Rukmini, the princess of Vidarbha, by abducting her from her wedding. According to some texts, Krishna had 16,108 wives, of which eight were chief - including Rukmini, Satyabhama and Jambavati. Krishna also married 16,100 maidens who were being held in captivity by demon Narakasura, to save their honor. Krishna killed the demon and released them all. According to strict social custom of the time all of the captive women were degraded, and would be unable to marry, as they had been under the control of Narakasura, however Krishna decided to marry them to reinstate their status in the society. In Vaishnava traditions, Krishna's wives are believed to be forms of the goddess Lakshmi - consort of Vishnu. Krishna was a cousin of the Pandavas - one of the two parties in the Kurukshetra war (the Mahabharata war). Once battle seemed inevitable, Krishna offered both sides to choose between having either his army or simply himself, but on the condition that he personally would not raise any weapon. Arjuna, on behalf of the Pandavas, chose to have Krishna on their side, and Duryodhana, chief of the Kauravas, chose Krishna's army. At the time of the great battle, Krishna thus acted as Arjuna's charioteer. 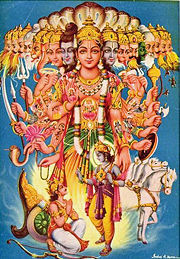 The Bhagavad Gita is the advice given to Arjuna by Krishna on the battlefield just prior to the start of the fighting. Following the war Krishna lived at Dwaraka for thirty-six years. Then at a festival, a fight broke out between the Yadavas who exterminated each other. His elder brother Balarama then gave up his body using Yoga. Krishna retired into the forest and sat under a tree in meditation. A hunter mistook his partly visible left foot for a deer and shot an arrow wounding him mortally. 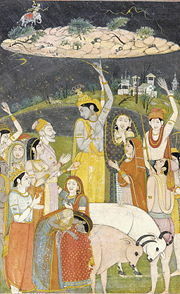 According to the Mahābhārata, Krishna's death was caused by a curse by Gandhari. Her bitter anger after witnessing the death of her sons caused her to utter this curse, because she believed that Krishna did not do enough to stop the war when he had the full capability to do so. Upon learning of the curse, Krishna smiled and accepted it, stating that his duty was to fight for, and protect, the righteous people, not to prevent the war. According to Puranic sources, Krishna's death marks the end of Dvapara Yuga and the start of Kali Yuga, which is dated to February 17/18, 3102 BCE.